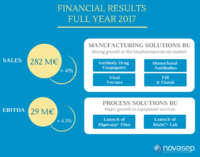 Lyon, France, April 25th, 2018 – Novasep, a leading supplier of services and technologies for the life sciences industry, today announces a +4% increase of sales and a +4.3% increase in its EBITDA for 2017. “Back to Basics”, from 2012 to 2017, and prepared the implementation of its second stage: “Rise-2”. Manufacturing Solutions offers process development and production of active ingredients services to pharmaceutical and chemical industries. Manufacturing Solutions has two service lines, Synthesis which concentrate the services for “small” molecules production, based on chemical reactions and Bio which offers services for the production of “large” molecules, based on bio-chemical processes. Process Solutions offers process engineering services for the food/feed industry and a range of purification equipments for the pharmaceutical industry. 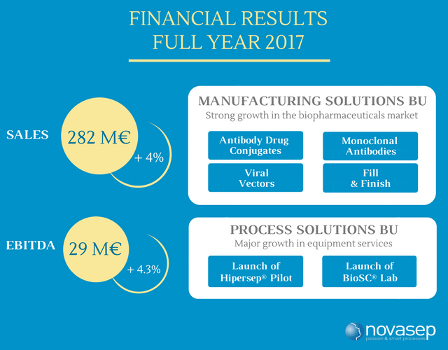 Overall, Process Solutions sales are up 6% year on year. While the Industrial service line has been affected by the slowdown of the sugar market, the Equipment service line has attained an exceptional growth of 33% in 2017, confirming its objectives. The performance of this service line has been supported by the launch of new equipment range and an efficient commercial strategy, successfully gaining market shares in the LPLC segment.